Spring classes. 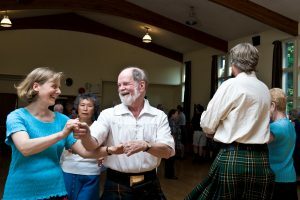 Introductory Scottish country dance classes. Tuesday nights 7:30 to 9:30 pm. No partner needed. Five Classes for $25. April 30 to May 28th at the City Light Church Hall, 550 Obed Avenue. To register call 250-598-0207 or email viscds@shaw.ca For classes dress casually and wear flat soft-soled shoes. Mini Socials. Thursday nights April 18th to May 23rd 7:30 to 9:30 pm. $5 drop in fee. Scottish country dancing experience needed. City Light Church Hall, 550 Obed Avenue. Summer dancing socials begin on June 6th, Thursday nights 7:30 to 10:30 pm. $8 at the door. Scottish country dancing experience needed. Practice classes on Monday nights starting on June 3rd. ($5 drop in) City Light Church Hall, 550 Obed Avenue. .Interested in Scottish Country Dancing? The Van Isle dancers are a lively group of over 130 dancers who love to introduce newcomers to the joys of Scottish Country Dancing. We run five classes a week ranging from the basic to advanced levels. It’s a great way to keep fit and to meet new people in a very social setting. Couples and individuals are all welcome. No partner is required. Dress casually and wear soft soled shoes.